The DRD Kivaari disassembled in its hard carrying case: note that the receiver is stowed with the scope mounted. 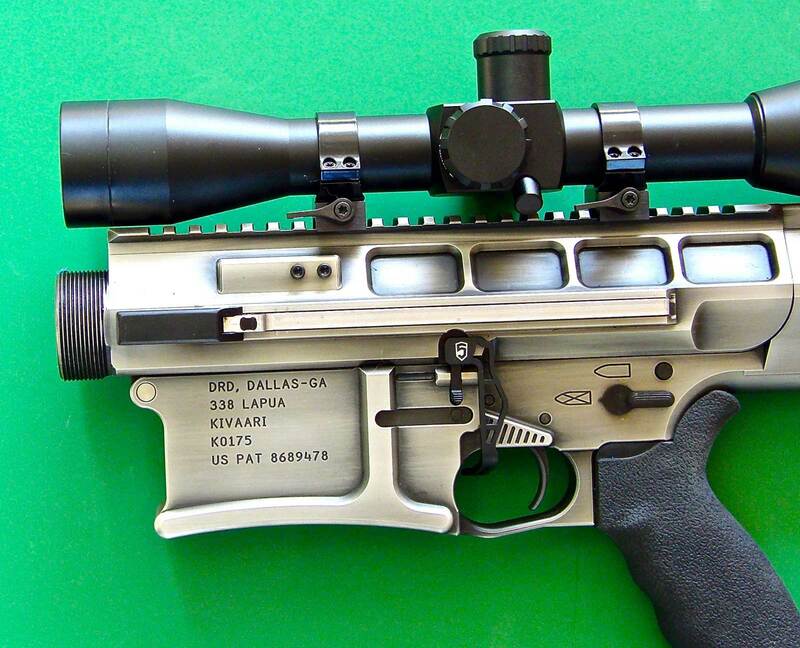 This allows the scope to theoretically remain zeroed. If possible it is always preferable to check zero. However, based on Thompson assembling and disassembling the rifle three times, then firing groups, it does hold zero well. Close up of the Kivaari with the bolt locked open to allow assembly or disassembly. 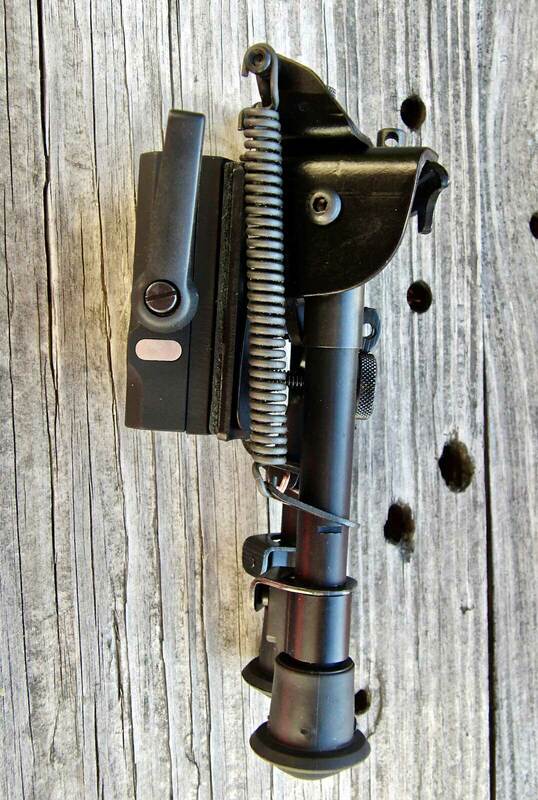 The bolt hold open/release lever is located above the trigger guard. Note also the selector switch. Kivaari’s three main components prior to assembly; note that the thread protector will have to be removed from the barrel threads prior to assembly. The M1913 rail at the front of the hand guard will take the bipod. Kivaari assembled and ready to take the shot. 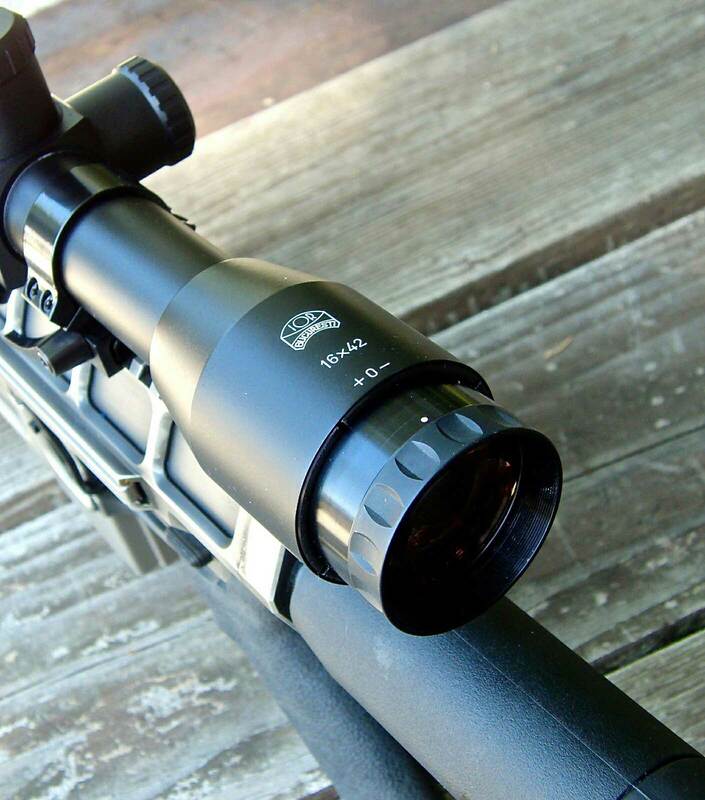 IOR Valdada 16-x42 offers good long-range visibility, excellent clarity, and a highly usable reticle. 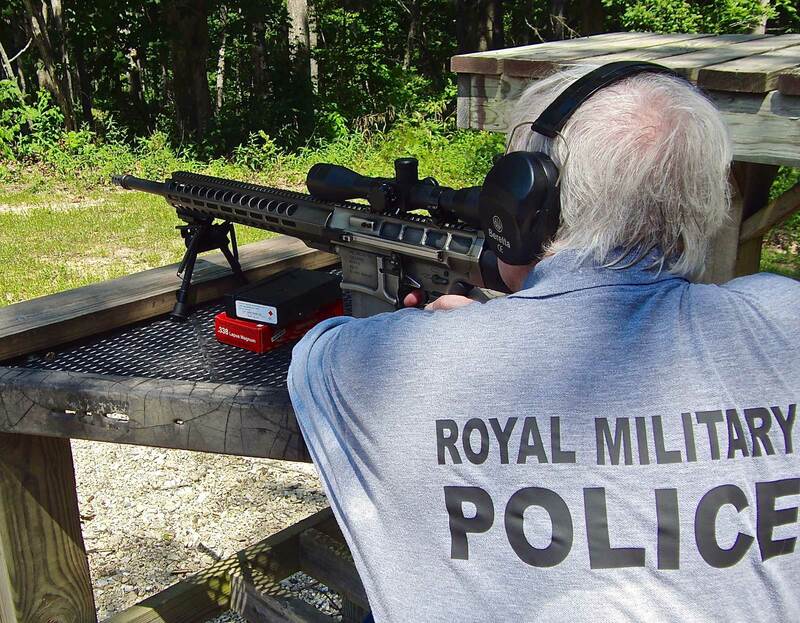 I became interested in the .338 Lapua Magnum (LM) Sniping Rifle primarily because various anti-terrorist units with which I had contact adopted it and were singing its praises. I wanted to determine if it really is as deadly at long range as its advocates claim. 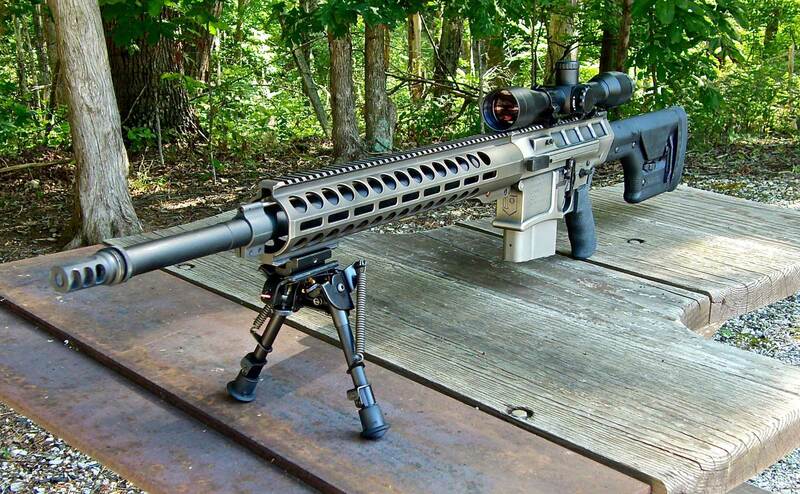 Until recently, a .338 LM held the record for the longest kill of 2,475 meters in Afghanistan. That record had stood since 2009, but in May, 2017, it was surpassed by over 1,000 meters by a shot of 3,540 meters in the Iraqi Civil War with a MacMillan TAC-50.Still, the .338 LM sniping rifle is a very serious weapon. 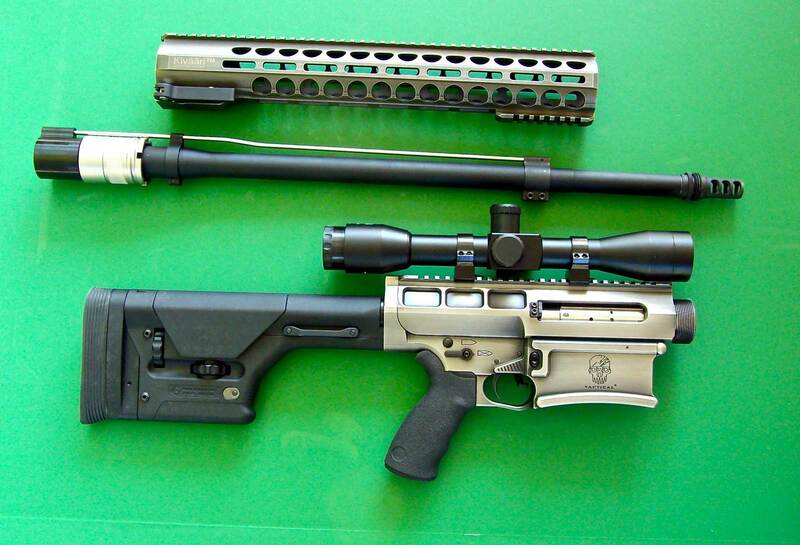 Generally, the .338 LM is lighter and shorter than the .50 BMG sniping rifle and has less recoil. It was designed as an anti-personnel rifle capable of punching through body armor at 1,000 meters. Unlike the .50 BMG, which is considered an anti-material rifle, the .338 LM was not intended for use against vehicles or other equipment. Having said that, I have fired .338 LM rounds through concrete blocks to hit a target. It has also been used to take enemy personnel in vehicles. It can be used to destroy sensitive communications/computer equipment or enemy weapons such as machine guns or missile launchers.Any sensitive electronic gear can be devastated with a 250 or 300 grain .338 LM bullet. Basically, it’s versatile; it’s designed to eliminate bad guys but it can also eliminate bad guys’ equipment. The .338 LM sniping rifle has proven especially appealing to special operations snipers who may have to hike some distance to their hide. Even if inserted by helicopter, vehicle, or small boat, the shooting position will likely entail a slog. And, many snipers using the .338 LM have operated in Afghanistan where long shots may be across mountainous terrain, mountainous terrain that requires climbing. As a result, development of lighter, more compact .338 LM sniping rifles has been a priority for manufacturers of precision rifles. 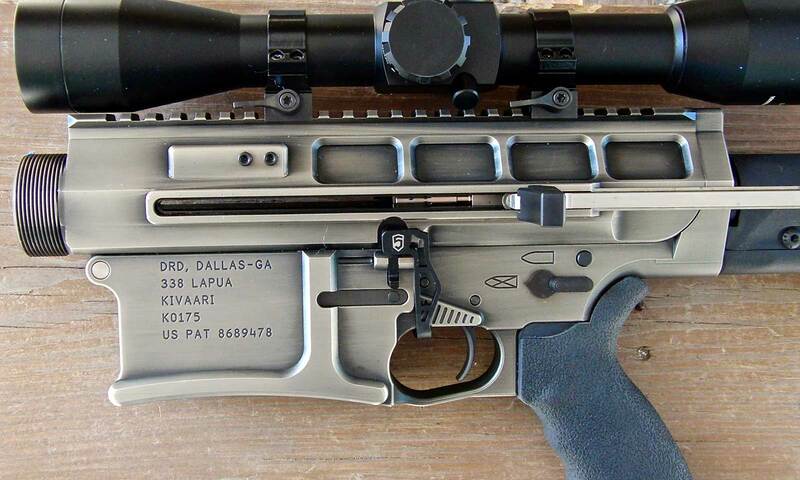 The usual fixes have been shorter barrels, which degrade the long-range performance of the .338 LM cartridge or folding stocks, which often actually add to the rifle’s weight. 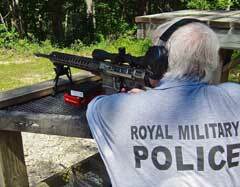 DRD Tactical offers another approach. DRD is known for its high-quality takedown AR-type rifles so I was very intrigued when I learned that they offer a takedown .338 Lapua sniping rifle. Not only that, but it’s a self-loader! Designated the Kivaari—Finnish for rifle—this is a .338 LM with some real advantages. Obviously, the fact it breaks down into three main parts—receiver/stock with scope mounted, barrel, and forearm makes it easier to transport. Its semi-auto action is also appealing. Once in a hide, the less movement a sniper has to make the better. A skilled rifleman can work a bolt smoothly, but not having to work a bolt is even smoother. Faster repeat shots are also possible with a self-loader. Another consideration with a self-loading .338 will be less noticeable recoil. 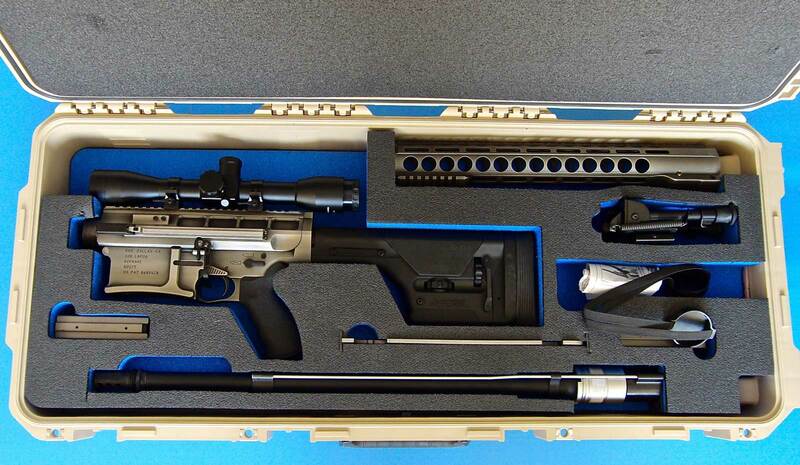 Although the hard case that is standard with the Kivaari is excellent and may be moved around readily using its rollers, it is not optimum for a sniper that has to transport his rifle into shooting position. Therefore, as an alternative, DRD offers a backpack designed to carry the disassembled rifle. 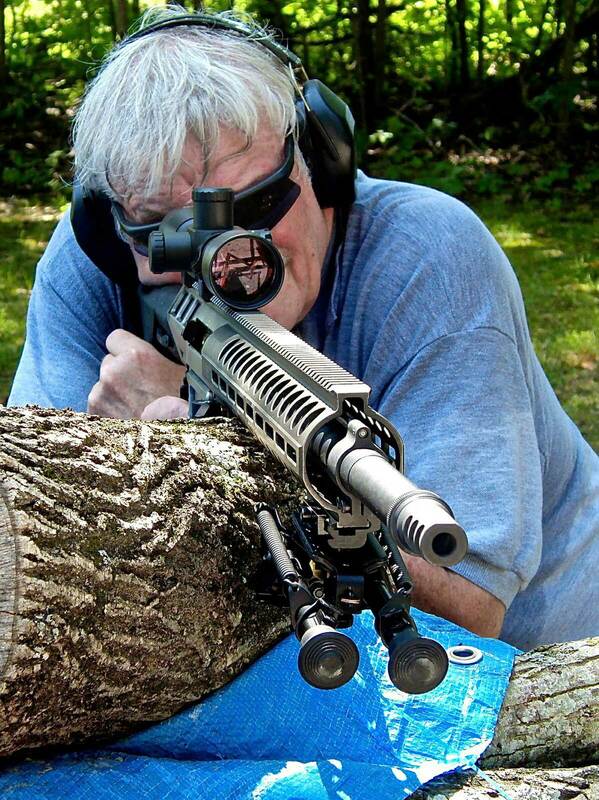 For military snipers, especially, that looks like the best option. There could be another advantage of using the backpack. The hard case has cutouts for the components of the Kivaari system. The cutout for the scope when mounted on the receiver puts some restrictions on choice of optic, though the restrictions may be more on the mount. The scope must fit the dimensions of the cutout or the user must alter the cutout. Height of mount and length of scope are important factors, as is the size of the scope’s objective. If the right scope/mount combo is used, a long-range variable suitable for shooting to 1,500 meters may be mounted. But, anyone purchasing a Kivaari must realize that some optical planning will be necessary.The backpack seems to offer a little more leeway in choice of scope, but I must admit that I have only seen photos of the backpack and have not tried it. Another factor in mounting the scope arises with the way the forearm slips into place around the barrel. There must be room to fit it flush against the top rail. Thus, the objective has to offer at least minimal clearance above the top rail. I found that with the 50mm lenses of some of the long-range scopes I normally use on .338 LM rifles and the mounts I normally use, I could not get that clearance. Fortunately, I knew that IOR-Valdada, which offers excellent scopes, had a long-range 16X fixed power scope that only has a 42mm objective. I assumed that it would work with a set of the 30mm medium rings I often use, and it did. This Valdada 16x42 Tactical Scope uses the MP-8 reticle, which I have found works well for precision shooting at longer ranges. 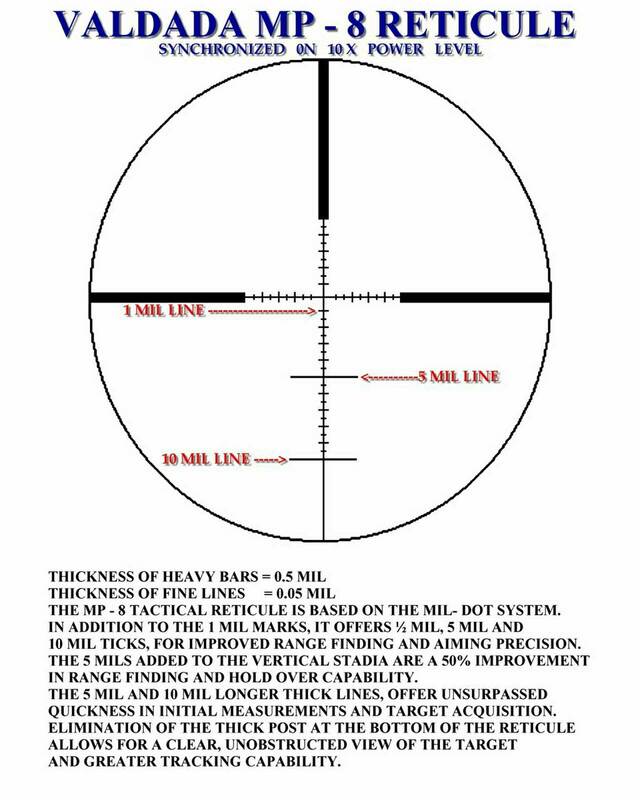 Though these days, I normally use a laser range-finder and/or a program such as GeoBallistics on my Mini IPad, the MP-8 reticle is also useful for ranging. I’ve always used variables on .338 LM rifles so was interested to see how I liked the fixed power 16X scope; I like it. The focus allows quick adjustment for closer range (40 yds) to infinity, and I find it crystal clear.So far, I’ve been testing the Kivaari at 300 yards and less to check functioning and get it zeroed.When I can get access to range that will allow longer range shooting, I may find that I miss the higher magnification on some of my variable scopes. 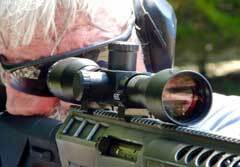 Having said that, I have a variable with 20X the highest magnification that I’ve used for years on .338 LM rifles so I may not notice that much difference. Another reason I like Valdada scopes is that they are precise in adjustment. 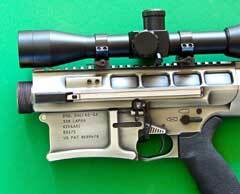 The 16x42 uses 0.1 Mrad clicks at 100 yards (roughly one/third of an inch). I managed to get the scope initially zeroed at 200 yards with 12 rounds. When shooting a .338 LM where each round costs $3.00 or more that is a real advantage. By the way, I know some writers have written articles on zeroing with one or two shots. They must be smarter than me!Of course, precise adjustments are vital for a scope on a .338 LM rifle to get precise shot placement. After assembling the Kivaari 10 or 11 times, I have my time down to 2:45 for the whole process including attaching the bipod, which requires tightening a lever to lock the Harris HBRMS bipod with MIM RotoPod adapter into place on the M1913 rail. Note that the MIM RotoPod adapter allows faster installation than other types of adapters I’ve used. Based on my learning curve on other DRD Tactical takedowns, I predict I’ll cut that by 30 seconds or more. And, let’s face it; normally, fast assembly of a sniper rifle is not going to be an issue. Another noteworthy point is that the Kivaari held zero quite close when disassembled and reassembled, but I was only checking that at 100 yards. I’ll check that again when I can shoot it at 500 yards or more. As I already mentioned, zeroing the Kivaari at a 100 yards was fast. However, since the rifle is a .338 LM, I would normally zero it at 300 yards. That took another 9 shots to get it exactly where I wanted it. By the way, as the Kivaari is a self-loader, I was curious if the brass would be ejected far and wide, but it wasn't. As a lot of .338 LM shooters reload that is a positive. Among other positive features of the Kivaari I discovered when shooting it are that its Magpul PRS stock allows adjustment for comfort and cheek weld. 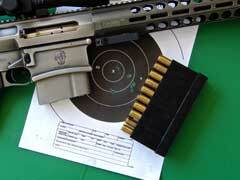 Based on past experience, getting the stock right is extremely important with a .338 LM rifle. The semi-auto action combined with the well-designed stock made recoil entirely comfortable. In the past when testing some bolt-action .338 rifles, if I were going to fire more than 20 rounds I made it a point to wear my ballistic vest to spread the recoil. With the Kivaari, sessions of 50 rounds or so wearing a light shirt have not caused any discomfort. I did not chronograph any of the rounds I fired through the Kivaari: CorBon 225-grain T-DPX, Black Hills 250-grain Sierra, and Nammo 250-grain Scenar functioned reliably in the Kivaari. I would assume, though, that velocities and range would be down a bit with the Kivaari’s 24-inch barrel compared to the 27-inch barrels on a lot of .338 bolt guns. As the Kivaari is a self-loader, accuracy is not going to be as good as with the typical .338 LM bolt guns. DRD advertises 1-MOA with Lapua (Nammo) ammunition.I found that to be valid in my test groups. For comparison, I have shot 1/2-MOA with various .338 Lapua bolt guns. That difference in accuracy will be magnified at longer ranges. For example, at 1,000 yards, my SAKO TRG-42 or Steyr SSG 08 .338 Laupa rifles will put three shots into 5 inches if I really do my job, which I rarely do!However, the Kivaari would stretch that group to 10 inches, assuming the shooter held true. Tactically, that would seem to suit the Kivaari better to give overwatch/support at ranges between 500 and 1,000 meters where it can penetrate barricades or vehicles. The Kivaari comes with a pair of 10-round magazines; that’s 20-rounds of ready ammo without purchasing additional magazines. The Kivaari may not offer the precise shot placement at extreme range that some of the bolt-action .338 LM rifles do, but it offers portability and fast follow-up shots. It would seem especially well-suited to use as a long-range overwatch rifle, one that the operator may carry readily into combat, assemble and deploy, and deliver quick and precise support fire. The Kivaari is a very comfortable rifle to shoot, allowing good shooting position and cheek weld due to the adjustable stock. Compact but powerful, the IOR 16 power scope allows quick and precise adjustments for windage and elevation. The Kivaari’s handiness, especially for a .338 LM sniping rifle, and low recoil allow use of an improvised rest. 2-inch, 200-yard 5-inch group using 250-grain Lapua ammo is typical for the Kivaari, which is advertised as a one-MOA rifle. 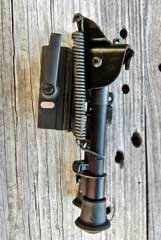 The RotoPod adaptor for the Harris bipod that aids in fast attachment. 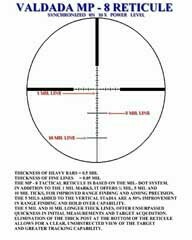 The MP 8 reticle on the Valdada 16x42 scope.